Use e.ggtimer.com to count down and alert you when times up. It’s like a kitchen timer for your computer. Simple, free, and nothing to download. 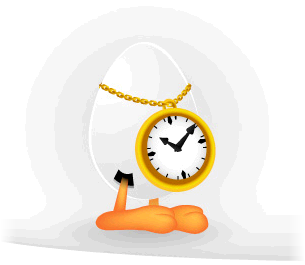 Visit e.ggtimer.com and type in your desired time. For example, “25 minutes” or “2 hours 15 minutes”. Hit enter and wait. Be sure to turn your speakers up. When times up, a popup will alert you with a loud sound. Another unique way to use E.ggTimer is to type in the address exactly what you want: e.ggtimer.com/10minutes. Add a bookmark with that address on your links bar for quick access. Need a break or want to be more aware of your time on the phone? Click the link. You’ll know when your 10 minutes are up. Here’s an easy way to include the date in your system tray on your task bar. Download this small, free utility: http://www.rcis.co.za/dale/tclockex/. Windows only shows the time in the tray. Although you can hover your mouse over the time to get the date, some might prefer it permanently attached. This application requires little resources, so your system still runs fast. You can customize it to display a simple date + time, or change the font and go wild with colors. Very configurable. Very easy. • “1Z9999W99999999999” – returns the UPS tracking information for that package. Also try FedEx, and USPS. Time management has always been important to me. I’m always trying to increase in knowledge and practice in this capacity of my own life. If you’re anything like me, your inbox may actually be your todo list. Sadly enough, this isn’t an efficient way of processing your tasks. If you’re overwhelmed with emails, read on.